With the arrival of summer comes the festival season, down at the local Arboretum just outside of Tetbury, the Forestry Commission hold their annual long weekend Forest Live Festival where several acts play within Westonbirt Arboretum grounds, through out the week from many genres of music. 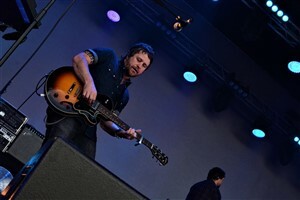 I headed down on the Thursday night to go and check out two indie rock bands Steve Mason with support from his band and the mighty Elbow. First up on the set was Steve Mason with his band. 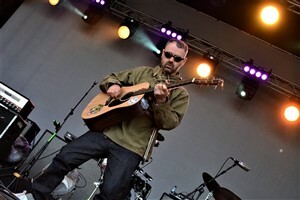 Hailing from Scotland, Steve and his band provided a very strong set with his chilled out Indie Rock sounds, while rocking old WW1 pilot goggles. 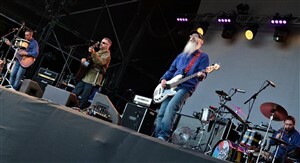 Having being on the scene for 20yrs Steve and the band played songs from their recent releases such as Meet The Humans and from their previous records. The band offered up a very solid set and for the fans in attendance, that are into the rock indie scene this was a perfect supporting / opening slot choice for the night. 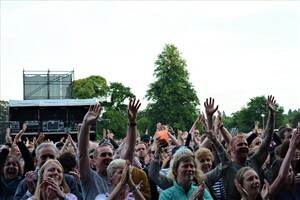 After a 45min stage swap round, the sold out crowd was eagerly awaiting the arrival of Elbow, as the sun set just behind the stage, the band made their way out for what was expected to be a great night of music. 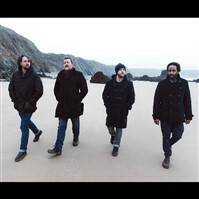 Elbow is formed of Guy Garvey (Vocals, Guitar), Craig Potter (Keyboard, Piano, Backing Vocals), Mark Potter (Guitar, Backing Vocals) and Pete Turner (Bass Guitar, Backing Vocals). Elbow put on a great set for their fans in attendance at this sold out show, throughout the set Guy Garvey took the time to interact with the crowd; talking to a young fan who was at the front of the crowd, who had taking the time to draw a picture for Guy and the rest of the band. Then when Guy Garvey read a brief statement on behalf of the forestry commission he asked that when ever he mentioned the “forestry commission” throughout the statement and throughout their set that the crowd would give a loud but quick cheer for the hard work and effort of all the members of staff that put the show together and for the smooth running by the stewards and security staff. 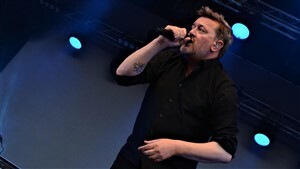 Elbow played a 18 song set for the sold out crowd pulling songs from their 7 studio albums including Any Day Now, New York Morning, Little Fictions and Grounds for Divorce. Having heard of Elbow before, mainly for their song One Day Like This, was great to hear this classic tune on their set, once this was belted out then the sold out crowd gave it all they had for the chorus and when Guy Garvey asked the band to go silent while the crowd took over the vocals duties, they did not disappoint. 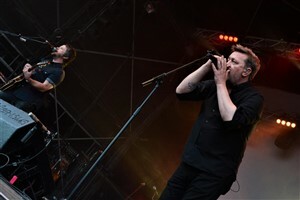 While both bands are not really the kind of music that I listen to in my spare time or actively seek out, I think with the sold out crowd and the backdrop of Westonbirt Arboretum, I was able to appreciated the music more and understand why so many people turned out to see Elbow. If the opportunity to see Elbow again comes round without a doubt I would see them again.